With its thick texture; dense, plush fibres and unique mitt design, the Dusting Mitt attracts and holds dust and other dust-related allergens and won’t let them go. Using popular spray cleaners to dust your home is not only expensive, but it also releases harmful aerosols into the air. Rub-on furniture polish may bring a luster to wood, but over time it can dull the finish, attract dust and create buildup. Also the chemicals in some of these products may aggravate allergies—or worse. Use it dry to dust all surfaces, including mini-blinds, fans, lamps, railings, chandeliers, plants, cupboards, vents, fireplace screens and more! Before dusting electronics, turn them off for a while as the electrostatic charge they emit can hold dust to them, competing with the pull from the static electricity in the mitt. For heavily soiled surfaces, such as blinds and screens, moisten the mitt or use a damp EnviroCloth™ and clean thoroughly. Clean by shaking vigorously outside or by using the Rubber Brush. 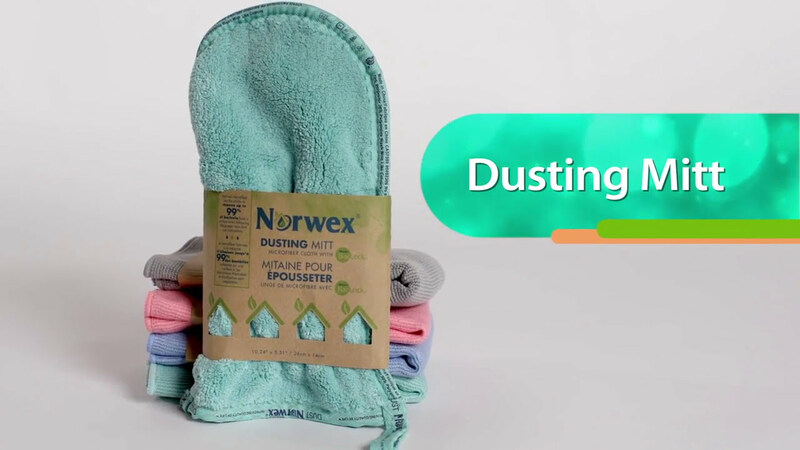 A Dusting Mitt that has been used heavily should be laundered using a Norwex laundry detergent, which contains no fillers. Do not use bleach, fabric softeners or dryer sheets. The ultra-soft and fine microfibre is woven into a higher pile for a more powerful static charge to attract and hold dust for a long-lasting clean. Used dry it creates static electricity that lifts the smallest particles of dust and dirt up into the cloth and prevents them from resettling back onto surfaces. Traps dust and grime in the mitt and leaves surfaces cleaner, so you won’t have to clean as often.